The purpose of the email was to inform developers the NDEV Program has ensured SpeechKit 1.4.5 is compatible with iOS 7. 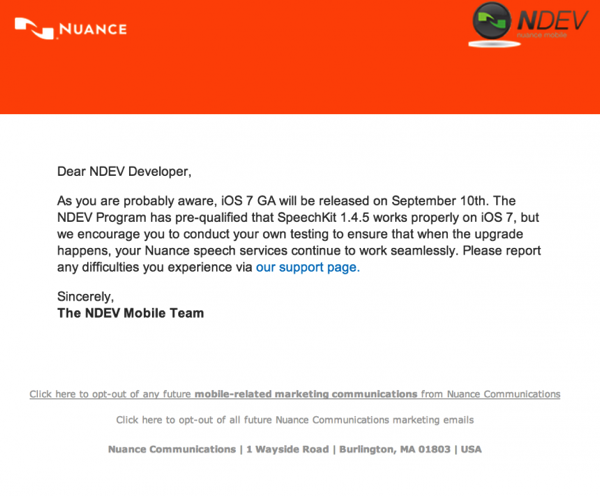 Despite the acknowledgement of the September 10 date by Nuance, the company could most likely be referring to the GM (golden master) release, which is typically made available to developers the same day of iPhone special events, like last year. As for a public iOS 7 release, many again expect it to be made available 7 days following Apple’s September 10 event, so we could see it on the 17th of next month if the company follow’s last year’s timetable again.